Who turned out the lights on Jeremy Bentham? 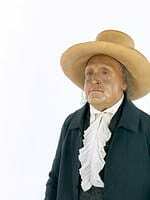 The auto-icon of Jeremy Bentham is 183 years old and counting. Over this time it has attended parties and UCL council meetings, had its heads (wax and mummified) stolen by students, twice visited Germany and also taken a ride in a red Morris Marina. It’s fair to say that Jeremy Bentham has led an active after life, and UCL Museums are committed to ensuring that it survives for another 183 years and more. During recent conservation work it has become apparent that although the auto-icon appears safe and secure it is actually subject to a very damaging environmental factor – high light levels (Cue dramatic sounds and possibly someone screaming in the distance). Ok so actually of all the risks the auto-icon faces this doesn’t sound like a particularly bad one, especially compared to fires, wars, insect infestation and the afore mentioned head thefts (all of these the auto-icon has survived at one point in its life). But high light levels are a huge danger to the auto-icon, and can cause irreparable damage. All sources of light, whether natural or artificial, can cause extensive and irreversible damage to materials. Some materials undergo chemical change – for example many inks, dyes and pigments will transform, causing fading or change in colour – while others undergo physical changes if overexposed – many textile fibres, for example, lose their mechanical strength. The auto-icon is made of many organic materials – wool, silk, leather, basketry, pigmented wax. These materials are particularly sensitive to the damaging effects of light. The effects of light are cumulative, which means that the more light the auto-icon is exposed to over its life time the worse the damage will be. Between 1850 and 1898 its believed that the auto-icon was stored out of sight and out of mind in a store room or cupboard at UCL, rarely (if ever) being exposed to the light. This, along with the fact that it always appears to have been kept within the inner box it sits in now, means that it has been exposed to a relatively low level of lighting. But in the modern period, with the increase in use of electric lights, its expose has increased dramatically. In order to safe guard its future we have made the decision to disconnect the strip lights within the auto-icons box, which are always on during opening hours. The spot lights, which are controlled by a sensor, will remain in use. This will mean that the auto-icon appears darker than usual, however when people get close the lights will still come on to allow visitors to view them as before. We welcome all feedback. Please let us know what you think be leaving a comment below, or alternatively contacting me on nicholas.booth@ucl.ac.uk. Nick Booth is one of the curators of the Teaching and Research Collections. Could you please look at changing the contrast between your text and your background. It is very difficult to read for anyone with less than perfect vision. Grey text on an on-off white background is not helpful. Nor is the light blue in the sidebars. (ex-UCL, but without the eyesight he had. Thanks for your comment, and I’m sorry that you found the text / background contrast hard to read. I passed your comment onto our marketing manager and UCL’s Web and Mobile Services. Unfortunately at present we are restricted to the colours we can use, however we are hoping to redesign our websites and we will use your comment to feed into the project. In the meantime we will see if we can change the colour to something easier to read. Thanks again for your comment, its led to quite a big conversation amongst staff here and we hope to get it right in the future.